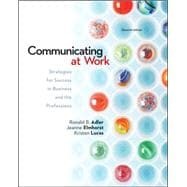 The 11th edition of Communicating at Work enhances the strategic approach, real-world practicality, and reader-friendly voice that have made this text the market leader for three decades. On every page, students learn how to communicate in ways that enhance their own career success and help their organization operate effectively. This edition retains the hallmark features that have been praised by faculty and students--a strong emphasis on ethical communication and cultural diversity, discussions of evolving communication technologies, and self-assessment tools--while incorporating important updates and ground-breaking digital teaching and learning tools to help students better connect to the course material and apply it to real world business situations.